Hot on the heels of our review of the utterly enormous Mercedes-Benz AMG Petronas F-1 paddock by LEGO, with it’s richly detailed shop space and cleverly equipped camera gear, comes a far simpler LEGO kit for auto enthusiasts. 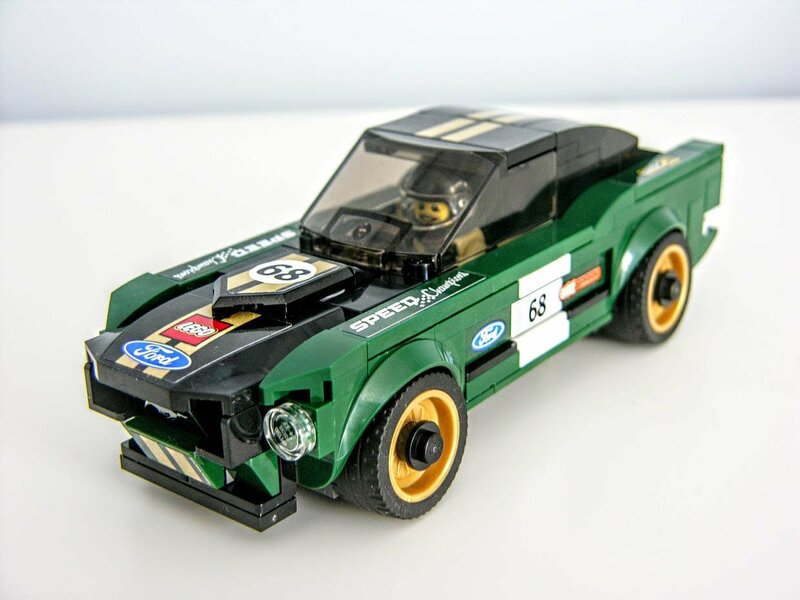 While neither Ford nor LEGO went as far as to call the 1968 Mustang Fastback I received a “Bullitt Mustang,” the kit’s color scheme and undeniably serendipitous arrival time pretty much tells us all there is to know. 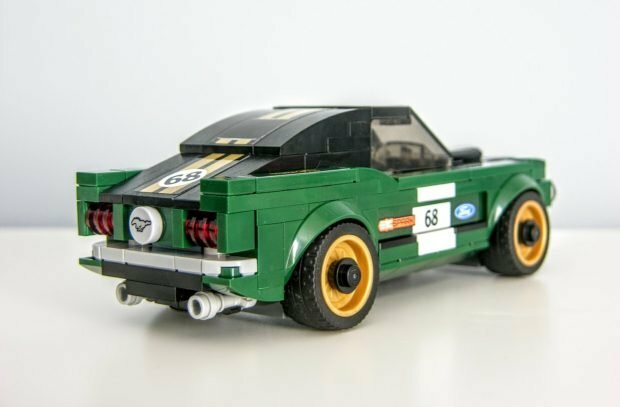 I recently got up close with Steve McQueen’s Mustang at the Detroit Auto Show this year, a precursor to the 2019 version’s release later this year, and an absolute monstrosity compared to what you see here today. So until the time comes for me to climb behind the wheel once more, and drive the next Mustang spin-off, I have this little beast to fiddle around with. 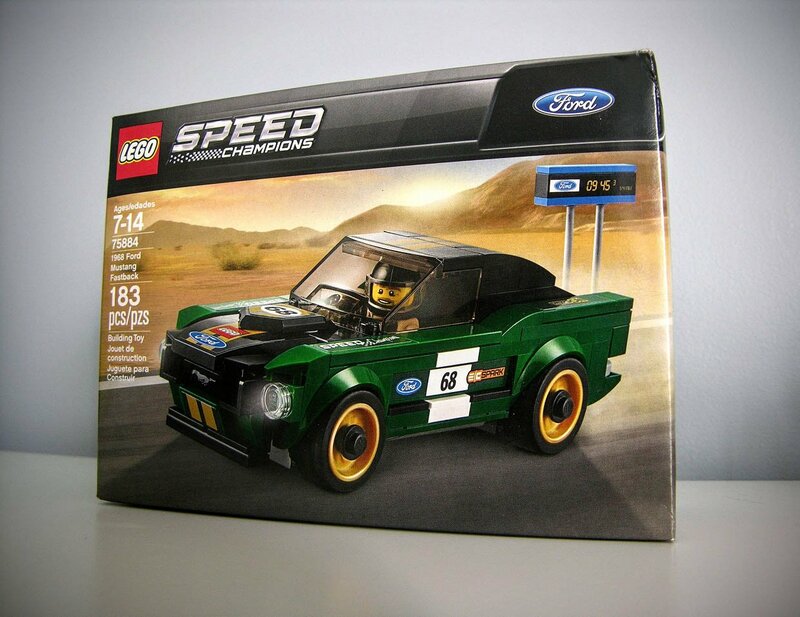 Packing 183 pieces, period-correct accents, a track-time board, and one scruffy looking driver, this $15 quick build looks and plays the part beautifully. 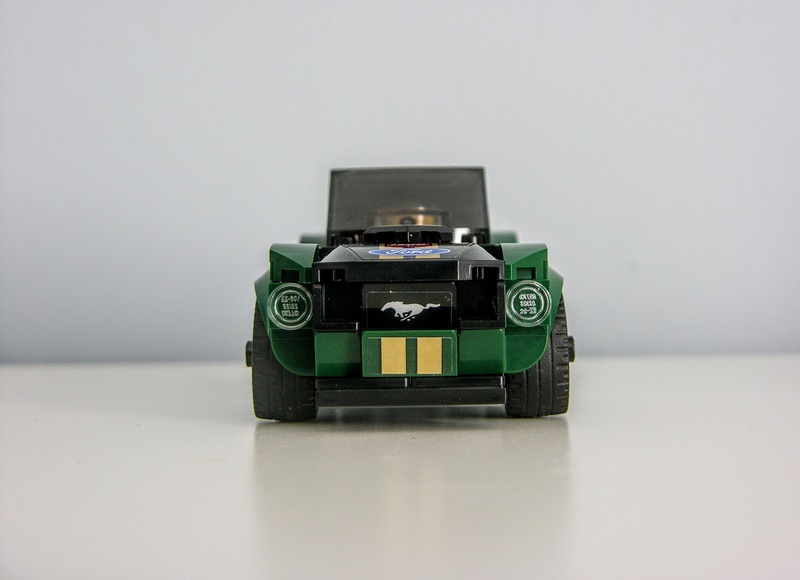 Featuring a removable windshield, bulging fenders, a dual-port exhaust, gold wheels, an iconic hood cowl, and loads of little Mustang accents, things appeared to be spot-on just by looking at the illustrations on the box. This was going to be a really fun build. I could feel it. 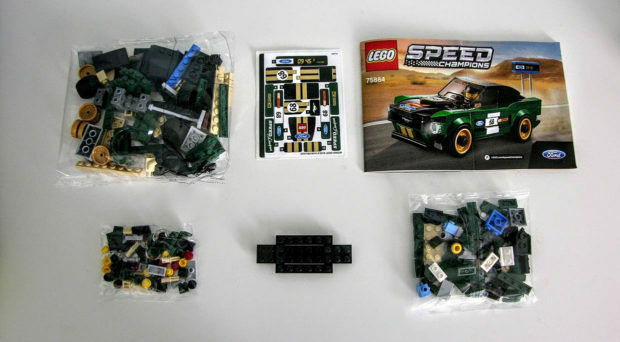 The build began the same as almost any of the other LEGO Speed Champions car kits, with individually bagged bricks in varying sizes, a sticker sheet, a core chassis frame, and an instruction manual all neatly packaged inside the colorful cardboard box. From there it was on to assembling the driver, the time board, and finally, the car itself. While I feel that the track time board could have been a little more retro looking (this is a 1968 race car right? ), the driver’s vintage race suit and the car itself more than made up for this unusual anomaly. However, in LEGO’s defense, at least the team had the foresight to make the sign match Ford’s favorite shade of blue. Back on the build, things come together in a tidy affair, as cockpit and both front and rear fenders make their way on board. 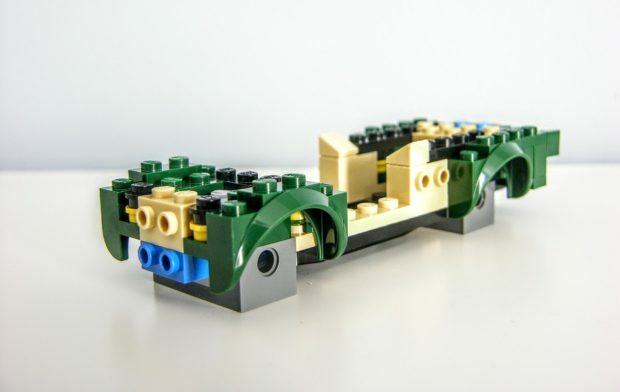 Both bumper reinforcements and door panel frames seem extremely well thought-out, and I admire the amount of bricks that have been allocated to these areas in order to bolster both strength and rolling weight. Make it too heavy and it won’t roll very far. Too light and it won’t track straight. Not enough reinforcement throughout and you face catastrophic demolition upon even the slightest contact with a chair leg or door jam. Mechanical engineering children’s toys. Why yes, yes that is a thing after all I suppose. Prior to tossing on the dual exhaust, as well as the shiny center disc between the two, I snapped together the vehicle’s rocker panels, siding, hood, and sloping rear decklid. After attaching all four rubber-wrapped wheels, as well as their black center caps, I immediately plopped the driver into his happy place, and took him for a spin. Rolling distances for this Mustang proved to be quite good due to the vehicle’s independent hub assemblies, and because of its surprisingly hefty curb weight (it is a 1968 model after all), tracks very true across the floor. 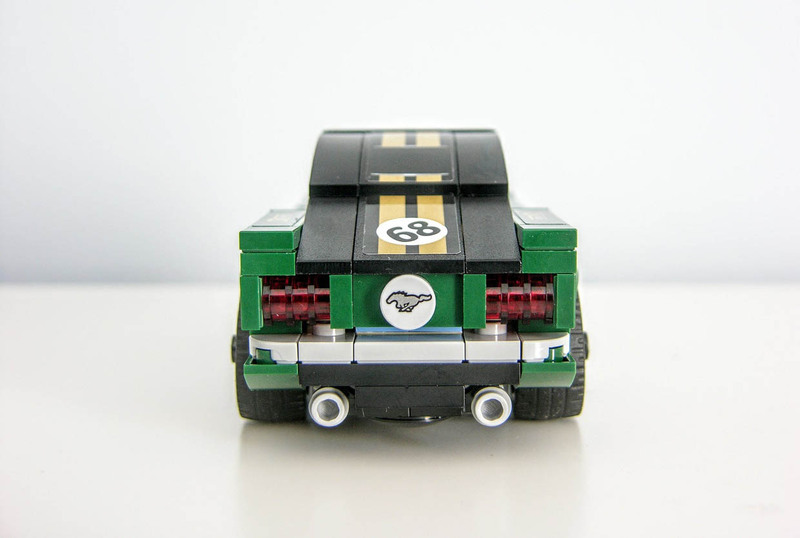 Foregoing frills for a minute, I sat back and looked at my freshly assembled 1968 Ford Mustang Fastback. Racing decals affixed, and clad in an instantly recognizable shade of green, this budget-friendly build hearkens back to a different time, and quite frankly, I love it. From the front air dam and angled racing pony badge buried inside the air duct, to the hood scoop, fender flares, and wonderfully detailed rear end, this kit strikes a visual chord that is both nostalgia-inducing and delightful. A small touch that continues to appeal to me are the way in which the meaty track on the wheels and tires causes them to bulge a bit, and how the entire car is “stanced” with a healthy splash of negative camber for a flush look. I also adore how detailed both bumpers are in both assembly and completion, with recessed lighting and sticker accents scoring major styling points. The raked rocker panels, and the way in which they feed rearward toward those iconic lower scoops also are winners for this kit, and looking at the car dead-on from the rear rewards you with a view that only a winning race car can offer. Sure, I would love to see a manual stick-shift with a little white cue ball attached to its top thrown into the cockpit. 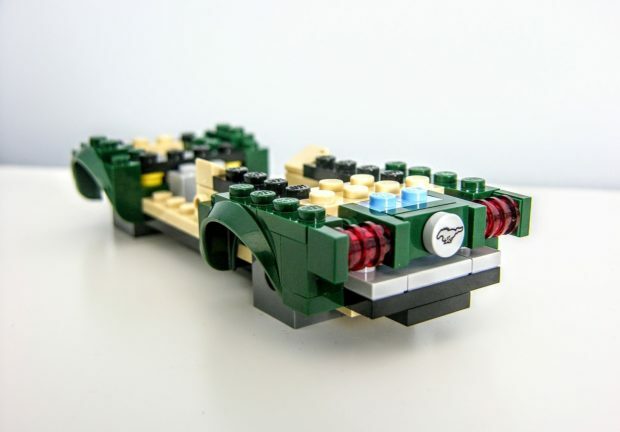 Yes, I know that LEGO really needs to start incorporating its pull-back axles from the Technic line to bring the Speed Champions series up to speed. No, there aren’t any hinged components for easy access to the engine underneath, nor are there any out back for tossing the included wrench into the Fastback’s rear storage space. But you know what? That’s alright with me. 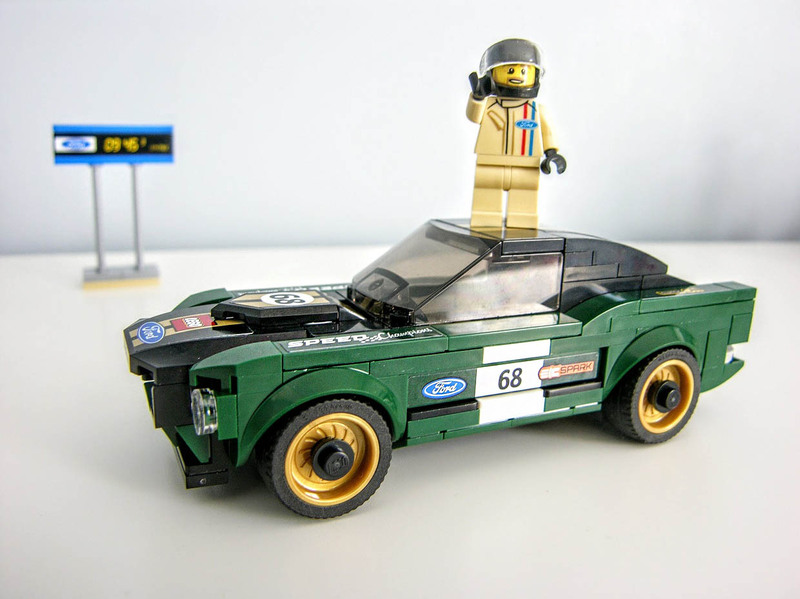 LEGO has one outstanding retro build kit on its hands here, Ford now has a fun little marketing tool to use for its forthcoming Bullitt edition Mustang, and we have the privilege of being able to procure both if bank account and interest permit. I don’t know about you, but that sure sounds like a win-win scenario to me.